Peroxy Shield: Kills C Diff, C Diff spores, MRSA, HIV, rotavirus, and so much more. This affordable, EPS registered sanitizer is one of the best sanitizers anywhere. Peroxy Shield brings hospital grade sanitizining to any facility. It applies quickly to all surfaces, and has a mild scent. Whether infection control or post infection sanitizing, Peroxy Shield has the power to kill the toughest germs in just two minutes! That is a claim none other can match. Our application process save on manhours. We can treat large or small buildings in a quarter of the time of any cleaning program. BioZone Protection is the follow-up application. This is our antimicrobial surface treatment that provide a germ inhibiting safeguard from re-infection. This process will protect surfaces for months after application providing an long-term infection control system. MRSA Infection Control: Our team can treat large facilities in record time. Testing before and after provides evidence of a effectively sanitized facility for post-infection MRSA sanitizing. Contaminated Surface: We apply an invisible coating on all surfaces (soft or hard) that inhibits bacteria and germs with a non-toxic, non-leaching coating that can last for SIX MONTHS. 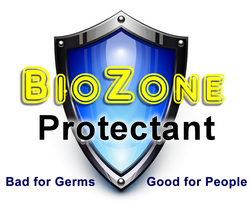 We apply BioZone Protectant to carpets, walls, furniture, and all surfaces. This is better than a cleaning service because we reach everywhere and the protection is 24/7 working to keep bacteria and germs from colonizing in areas shared by the community. Contaminated Hands: Get rid of your present hand sanitizer and use the BioZone Hand Sanitizer. There is no alcohol and no Triclosan. Just a very effective foam dispenser that is good for your hands but bad for germs. One application can last for hours of germ protecting safety. Contaminated Clothing and Uniforms: We use a special version BioZone Protectant to protect uniforms and clothing with the same long-lasting, germ-inhibiting power. You will also find that clothing will not smell because odor-causing bacteria cannot live on a BioZone protected surface. We know hand washing is an important part of disease control. We have all the tools to stop germs from colonizing in the shared areas of homes, offices, schools, day cares, medical offices, and workout centers. We can treat every surface, including carpets, equipment, toys, tables, and play equipment. We can treat towels with BioZone with our bacteria inhibiting process. Now, the towels will not get a bad smell and germs will not breed in it. We can provide bottles of BioZone to wipe down equipment between treatments to keep high-traffic areas at their peak of germ protection. We are specially excited to bring the BioZone protection to the sports community. Using our comprehensive system, it is possible to reduce infection to the absolute minimum. We can treat locker rooms, gyms, work-out equipment with no harm to the equipment. Place our BioZone Hand Sanitizer in key areas. people truly love this product and it works for more than minutes on hands. Hours later, the BioZone hand sanitizer will be fighting bacteria. Sports gear and unforms have two big problems. SMELL and GERMS. Since most of those nasty locker room smells are bacteria living on sweat, BioZone will keep sports gear and uniforms from foul smells for the life of the product. BioZone Protectant can reduce the spread of disease from shared clothing and indirect contact because it has the lasting action of destroying germs that land on the surface. Yet, BioZone is a Green product, non-toxic when dry, non-leaching in food areas, impossible to detect, but really bad for germs.